If you have not read my previous articles: Lester’s Despair – Part One and More Tragedy for Lester House, then I urge you to do that before continuing. I learned more about Lester and Mary’s (Besser) son, Jarold, than I really cared to know. It was concerning why he was sent to the state mental hospital and to jail. The morals charges were of the worst kind – out of regard for his living descendents I will not post the details. I will, however, say that it is all spelled out in some newspaper accounts (so if they go looking, they will find the stories). Jarold and his wife, Margaret, had four sons. I don’t believe they were very old before they were sent to live with foster families. Since some of the sons are still living I will call them Son One, Son Two, Son Three and Son Four (again some of the events of which I will write about are all available to be found in newspaper reports). In the mid 1970s, Son Two and Son Three, along with at least one other young man, killed a man. Apparently there was kidnapping and mutilation involved. As I perused the newspaper articles, the nagging thought I had, was to wonder if the father’s actions towards his sons had any bearing on their emotional states as young men. At least their grandfather, Lester House, had already passed away. This new tragedy would have been more than enough for him after all that he had been through. Son Two and Son Three were convicted of kidnapping and murder and sentenced to prison. Son Three was killed in prison and Son Two is still incarcerated. Son One passed away several years ago. I haven’t uncovered any information on Son Four – so it seems he has left his family and past behind – and really who could blame him? When I set out on the journey to discover family origins, I was thrilled by some of the information I found. My paternal grandmother had a sister? No one ever mentioned her before. Of course Gramma Amore had already passed away before I was born so there wasn’t any reason for me to ask if she had siblings. Not only did I learn that she had seven siblings but she had three half-siblings born of her father’s first marriage. As I researched my grandmother’s parents and brothers and sisters, I learned that her older sister, Julia, had been named after my grandmother’s grandmother – Julia Ann Lewis House. And so it had been with her oldest brother – named after his grandfather – Florus Allen House. Her name was on the program twice so she must have been smart. She died young in childbirth. I have never found out if the baby survived, but never hearing about it, I presume he didn’t . . . . I guess she was dead before I was born because I never remember seeing her. I found Julia’s marriage information listed on page 375 of the Coshocton County Marriages, 1811-1930; compiled from marriage records, Probate Court, Coshocton County, Ohio by Miriam C. Hunter, and published by the Coshocton Public Library in 1967. Twenty-five friends and relatives were gathered at the home of James W. House on East Main street on Christmas night to witness the marriage of Miss Julia A., daughter of Mr. and Mrs. James E. House, and Mr. Percy Tuttle of Cleveland, Ohio. The ceremony was performed by Elder B. S. House of the Adventists church at 8 o’clock, the wedding couple being attended by Miss Carrie Leach and Mr Herman Irons, marched to the strains if Mendelssohn’s wedding march played by Miss Inez Waite and took their places under a beautiful arch. After the ceremony a sumptious supper was served. The bride was tastefully dressed in white silk draped in chiffon and the groom in the customary black. This evening Mr. and Mrs. Tuttle leave on the W. & L. E. for Cleveland for a few days visit with the groom’s parents. They then go to Mt. Vernon to take charge as manager and matron of the Mt. Vernon Hospital and Sanitarium. Many beautiful wedding presents were received as the gifts of friends. Those present were Mr. and Mrs. James E. House, Mr. and Mrs. Allen Conger, Mr. and Mrs. Gray, Mr. and Mrs. John W. House, Mr. and Mrs. Sylvester Randles, Mrs. Bertha Rogensparger, Messrs. Floris House, Lester House of this city, Mr. and Mrs. Loyd Amore of Roscoe, Mr. and Mrs. B. L. House of Trinway, and Mr. and Mrs. R. T. Ragsdale, manager and matron of the Newark Sanitarium; Misses Carrie Leach, Inez Waite, Gloria Franklin, Mr. Herman Irons also of the Newark Sanitarium and Miss Grace Kline of the Mt. Vernon Hospital and Sanitarium. A few things popped out at me as I read that article. One – Julia wore a dress that seemed to be the equivalent of modern wedding attire as did her groom. That told me that either her mother, Frances, was able to procure material and sew the dress or it was purchased and probably at a price not many people paid for wedding clothes then. My great-grandfather had filed for a pension on his Civil War service as he had become infirm and wasn’t able to work or farm. Had the family been very frugal in their living that they were able to afford material or the dress? Had the dress been a hand me down from a previous relative? Or had Julia, herself, scrimped and saved in order to buy such a luxurious dress? The other item that jumped out at me was it appeared that Julia had some sort of training in the medical profession since she and her new husband had been hired to run the Mt. Vernon Hospital and Sanitarium which was a tuberculosis hospital at the time. Again I wondered where the money had come from for her to have had training in this field. Or did she really have formal training or a series of “first aide” classes that qualified her? More research led me to articles on her death. The following is from page 3 of the November 28th, 1907 edition of the Coshocton Weekly Times, Coshocton, Ohio. The family of James House, living in the eastern part of the city received a message at two o’clock this afternoon from Defiance conveying the sad news that their daughter, Mrs. Julia Tuttle had just died in that city as the result of child birth. Mrs. Tuttle was formerly a trained nurse in this city and was conducting a sanitarium at Defiance. She was about 27 years of age. The brothers and sisters of the deceased left for Defiance at once to attend the funeral. Coshocton relatives received the sad news Saturday of the death of Mrs. Julia House Tuttle at her late home in Defiance. Mrs. Tuttle was just past 27 years of age and was born in this county; she was graduated from the Roscoe high school and after that took a nurses’ training in hospitals in Cleveland and Newark. She was married last Christmas day to Mr. P.J. Tuttle and their only child died a few days ago after having lived but a few hours. Mrs. Tuttle’s death was caused by blood poisoning. She is survived by her husband, her parents, Mr. and Mrs. James E. House of North Eleventh street, the following brothers and sisters, John, James W., Floris, Mrs. Ella Amore, Lester and the following half-brothers and sisters Mrs. Lucinda Conger Mrs. Bell Ruby and E.F. House all living in this county. She was also a cousin of Elder House of the Seventh Day Adventists church. The arrangements for the funeral have not been made. Those articles answered my question on her training. Julia had taken nurses’ training in Cleveland – which is probably how she met her husband, Percy. Their child – neither article mentioned if it was a son or daughter – had died soon after birth. Julia, herself, had died as a result of the complications of child birth and had blood poisoning. That information leads me to wonder if she perhaps was Rh Negative and her child was Rh Positive. Or did she acquire an infection while in labor or giving birth that resulted in her untimely death. Was the infection passed on to the baby or was this a premature birth? All questions that may be forever unanswered. I didn’t find anything about her funeral but I do know that she is buried at Prairie Chapel in Coshocton County. She shares a plot with her younger brother, Charles, who died in 1896 at the age of 12, and her parents who died years after her. No mention of her child is on her tombstone. And a close up of her inscription. So what became of Percy, I wondered. Did he remarry? Have other children? In the 1920 Census, he and his wife, Adeline, were living at 12317 Osceola Ave. in Cleveland, Ohio. There weren’t any children listed as living with them. Percy was a nurse in Private Practice. 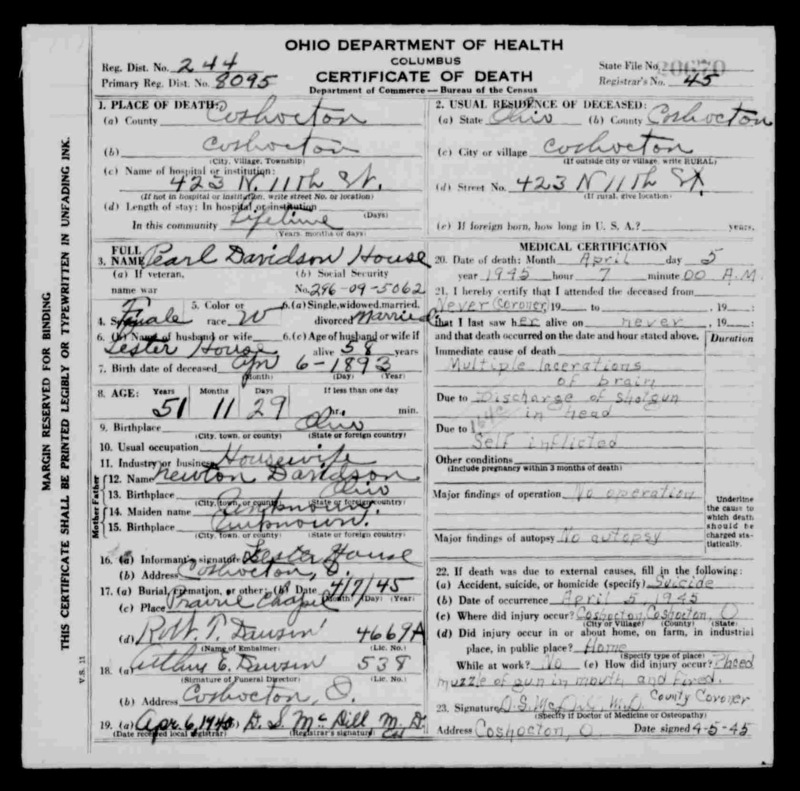 Then I found his death certificate that recorded his death as March 26, 1932 at the age of 51 years, 10 months, 6 days of interstitial acute nephritis brought on by uremia. He was listed as a Graduate Nurse who was self-employed. Did Percy ever set out to become a Medical Doctor? Or did he choose to be a nurse when such things as male nurses weren’t something you saw all the time? Was he the equivalent of the modern day Nurse Practitioner? How much education had he received? How long had he and Adeline been married? Had they borne children? Did he ever get over the death of his first wife or that of his first born child? Many questions will go unanswered but I feel as if I’ve learned more about my grand-aunt, Julia Ann House. In the late 1950’s through the early 1980’s, my grandmother’s paternal side gathered together each fall for the annual Wilt Reunion. I knew names of these relatives but not really who they were or how they fit into the family. As a young child (and then a young teen), I felt somehow on the “outside” of this family for I saw them once a year. Sometimes my grandmother’s first cousins would travel from Indiana to Ohio to visit her and sometimes my mom and I would accompany my grandparents to Indiana to visit them. That was the extent of my interaction with my Wilt Cousins and extended family. Going through the photographs my grandfather took to document the Wilt side of the family, has enabled me to actually put names to faces. Even though there are an awful lot of pictures that don’t have labels, my grandfather was very good at labeling reunion pictures. The above was how the photo was labeled by my grandfather. I’ve since found the names of these folks. In the 1st Row: (I think this is) John E. Wisehart, his wife, Wava June Wicker, Ricky Joe Wisehart, the nurse is either Nancy or Janet Wisehart. 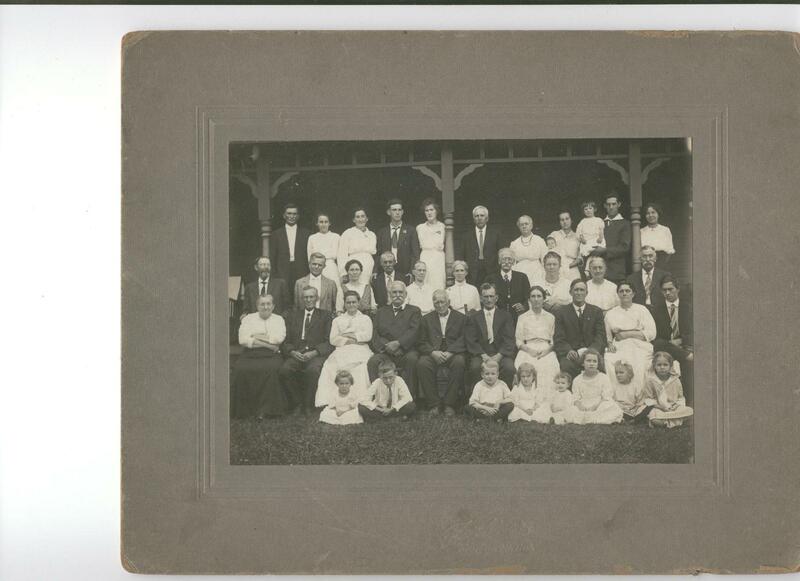 In the 2nd Row: not sure of the other son’s name, Ruth West Wisehart, Ward Wisehart, Ina Wilt Wisehart, Richard Wisehart, and Norma Gilmore Wisehart. Ina Wilt Wisehart is the daughter of Charles and Margaret (Fadely) Wilt. Charles is the youngest brother of my grandmother’s father, Joseph N. Wilt, which would make Ina and my grandmother, Vesta, first cousins. Ina was the oldest child of Charles and Margaret. She was born on November 2, 1896 (2 years older than my grandmother) probably in Henry County, Indiana. She married George Wisehart on December 12, 1914 in Henry County. (Their marriage record was found in Book 1, Vol. 4 of the Index to Henry County Marriage Records on page 392.) The couple had 4 children: Ward (married Ruth Louise West), Mary Margaret (married Fred Borror), Linda Lee (married Joseph Daffron), and John Richard (married Norma Gilmore). George died on May 13, 1959 and Ina died on November 23, 1967. Mary and Fred Borror along with their ten year old daughter, Mary Lou, all perished in a car accident on May 29, 1952 (source: Freda Pierce, cousin to Mary Wisehart Borror). Linda Lee (Wisehart) Daffron died at the age of 58 at a hospital in Richmond, Indiana. Ward Wisehart passed away on February 26, 2000. John Richard Wisehart is the last surviving child of Ina and George Wisehart. I’ve often wondered why the Wilt Reunions ended? Did life get too busy for people to gather together? After all the “first cousins” died, did their children decide it was too much trouble? Were there a smattering of family gatherings that only included the immediate families of the first cousins? The last Wilt Reunion I attended was in September 1983. It was held in Dayton at my brother’s home, and I was 6 1/2 months pregnant with my second child. It would be the last time I saw many of my Wilt relations. When you gather with family – be it immediate or extended – for a reunion, holiday, birthday, or even funeral – and photos are taken, please make sure to document the event and those in the picture. That includes listing how each of the people in the photo is related. Are they all first cousins? Who is their common ancestor? Are there in-laws in the picture? Make sure to list who they belong with. Are there non-related god-parents or close friends in the photo? Make sure they are listed out and whose friends they are or why they were considered important enough to be part of the picture. Write an account of the day especially the five W’s: Who, What, When, Where and Why. How was the weather? Did you have to travel? How? What type of travel experiences did you have? What activities did you or family members engage in? What type of stories were told and by whom? Is there a recording of this event? Then keep your documentation, photos and recording (DVD) together or list on the documentation (as well as the DVD and photos) where all the necessary elements are. Someday when your descendents see the photos, the DVD or read your account, they will feel as if they were there and there might not be as many questions as we have about our ancestors’ activities. Some of my earliest memories involve family reunions – whether they were impromptu gatherings with the local family members on the weekend or planned affairs requiring travel to another city or state. There were reunions that continued throughout my childhood and reunions that began during my childhood. Before I came along there had been others. Other reunions were held and by the time I began attending (in the ’60s), they had changed to the Amore-Baker reunion. This merged the Amore family with the Baker family (my grandfather’s sister – the only daughter of Henry and Annie Amore – married a Baker). These reunions were held at the Grange Hall on the Coshocton Fairgrounds in July each summer. There was plenty of good food, games (horseshoe, softball, frisbee) and family chat interspersed with the normal “business” part of the reunion – election of the following year’s officers, reading of the business minutes, a treasurer’s report, and planned entertainment. Up to 80 persons attended these reunions. 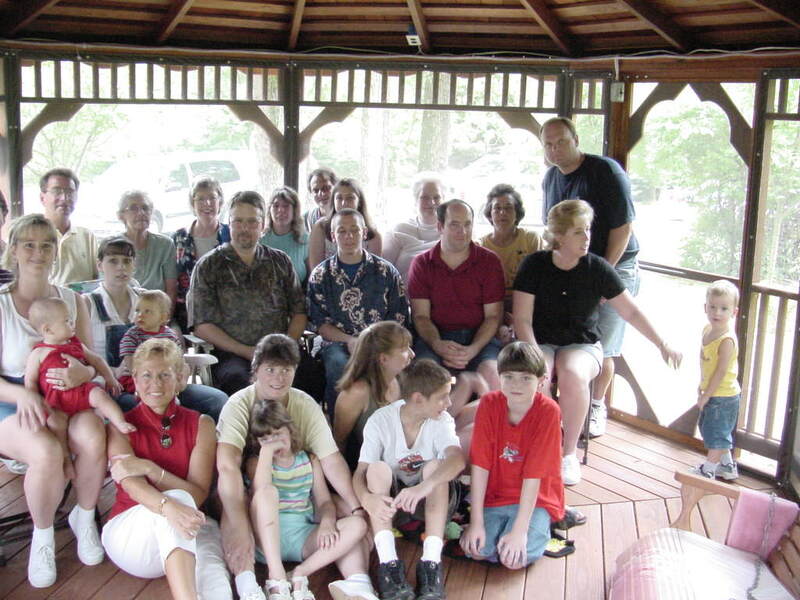 My dad’s siblings held a reunion once each summer as well. The first one was at my Uncle Paul’s home in St. Clare Shores, Michigan in the summer of 1967 attended by all but one of the children of Lloyd and Ella (House) Amore and their families. Each summer the Descendents of Lloyd and Ella Amore met at one of the sibling’s homes. The second year we held the reunion at our home outside of Dayton. When I was close to adolescence, my grandfather and his two first cousins, Glen O. Blazer and Ada Blazer Black, decided to hold the Johnson-Blazer reunions. Most of the time these were held in Urbana, Champaign County, Ohio at the home of Glen and Nina Blazer. Once we hosted the reunion at our home. 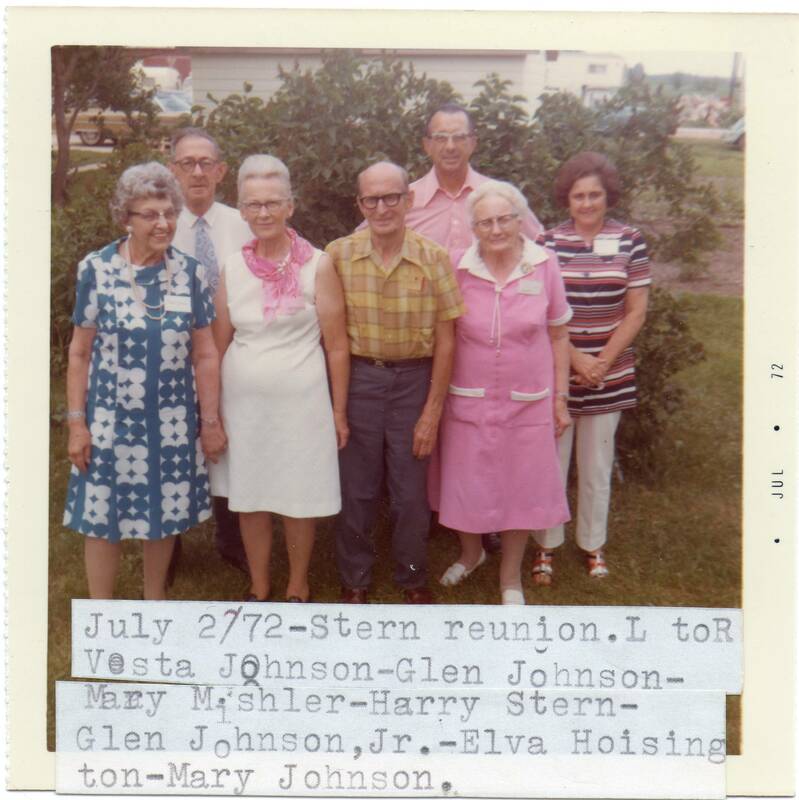 The descendents of my 2nd great-grandparents – Emanuel Bushong Stern and Nancy Caylor Stern – (Stern Reunion) was held at Beaverton, Michigan in the early in July 1972. It was held on a descendent’s farm. 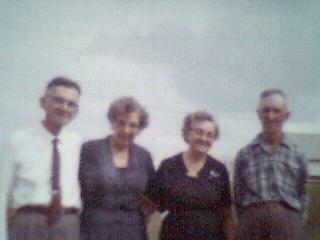 Long before I came along, there was also the Caylor reunion for the descendents of Abraham and Susannah (Miller) Caylor. The only information I have about these reunions is a few pictures with the words “Caylor Reunion” on the back. 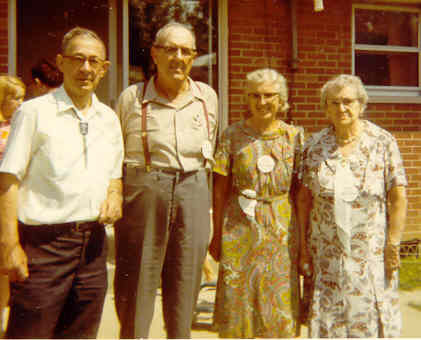 My grandfather’s family also held reunions prior to my time. They ended about 20 years before I was born. These were the Johnson-Shively reunions. I have as much information about these as I could hope since I have the actual Reunion Book in my possession. It includes minutes from each reunion held, those invited, births, deaths and marriages recorded each year, and addresses. 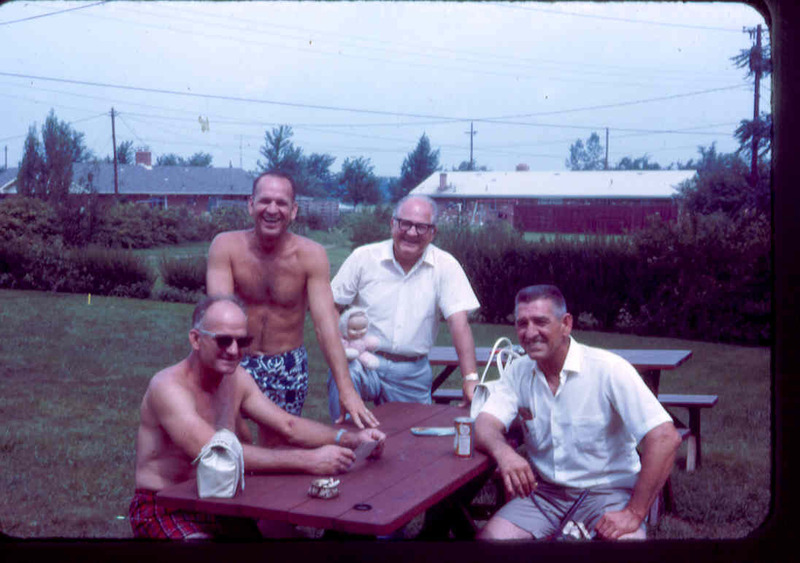 One of my Johnson cousins scanned the photo taken at the first Johnson-Shively reunion and shared it with me. I don’t know who the photographer was so I would like to thank my cousin, Virginia, for allowing me to have a copy of this. Johnson and Shively reunion organized Aug 16, 1915 at the home of J.L. Johnson 99 Indiana Ave. Anderson, Indiana. Several relatives and minds were invited to this home in honor of J.W. Johnson. “J.L. Johnson’s father”. It being his birthday. He being the oldest of the Johnson family now living. A great number of relatives responded from all over the state and a general good time was enjoyed by all. At the noon hour a sumptious dinner was served. This being one of the most important events of the day was enjoyed by both young and old to the fullest extent. President J Milton Johnson, Lapel, Ind. A motion was made and 2nded to meet the next August at Riverside Park, Anderson, Indiana. Business being concluded all departed for their homes thinking it a day well spent. In July 2002, the 1st “Cousins” reunion was held for the Descendents of Glen Roy Johnson and Vesta (Wilt) Johnson – my grandparents. It was held at my cousin’s home outside of Dayton, Ohio and attended by all but two of the cousins and their families. Other gatherings that we generally don’t consider “reunions” are when we are in Ohio or Missouri to visit. This past summer most of the family gathered at my in-laws’ home to celebrate their 60th Wedding Anniversary. The last time most of my husband’s side of the family was together were either at funerals or the 50th Anniversary celebration of his parents. In Ohio, most of my cousins gather together for a pot-luck meal so we can all visit. Johnson-Shively Reunion: Unknown newspaper; clipping emailed from a cousin. At Least It Wasn’t Moonshine! There’s a running joke in my family that my dad’s side of the family are either teetotalers or they drink like a fish. Apparently a bottle of pimentio extract caused quite a stir back in 1927. I guess that not even this was allowed during Prohibition! Background: Stanley Amore was my great-grandfather’s nephew (1st cousin to my grandfather). He was born in January 1880 to George Washington Amore and Catheirne Burden. Stanley was a restauranteur, the oldest child of the family, never married, and died on September 30, 1929 at the age 49 from Bright’s Disease. He was interred at Plainfield Cemetery in Coshocton County, Ohio. Lots and Lots of News! Jasia, at Creative Gene has posted the Carnival of Genealogy, 57th Edition on the theme: I Read it in the News! I haven’t counted the number of submissions but there are quite a few! I think there are a few who have submitted a post for the first time on a CoG! So scoot on over there and “read all about it”! Try to leave comments on the ones you read! Alva Lester House buried his wife, Mary Lucy Besser, on February 17, 1920 with their stillborn son and next to their two babies – Arthur and Esther – in South Lawn cemetery, Coshocton County, Ohio. With his two surviving children, Evelyn and Jarold, recuperating from the flu, and feeling as if life has dealt him a losing hand, Lester had to find a way to move forward especially when a few months later his older brother, James W. (Willie) House, died from bronchial asthma. A little over four years later, he married Pearl Davidson on June 14, 1924. She was the daughter of Isaac Newton and Mary Davidson of Keene, Coshocton County. Born the youngest of four children on April 6, 1893, she had lived in Keene until her marriage. Immediately she became a second mother to Evelyn, age 10, and Jarold, age 8. Even though Pearl was 31 years old at the time of the marriage, it is unknown if the couple tried to have children or if she had any pregnancy complications. Several months after their wedding, Lester’s father, James Emory House, passed away. He was 82 years old. The year following their wedding, Pearl lost her mother, Mary Davidson, due to diabetes. Several years later, Lester’s son, Jarold, went into the U.S. Army. 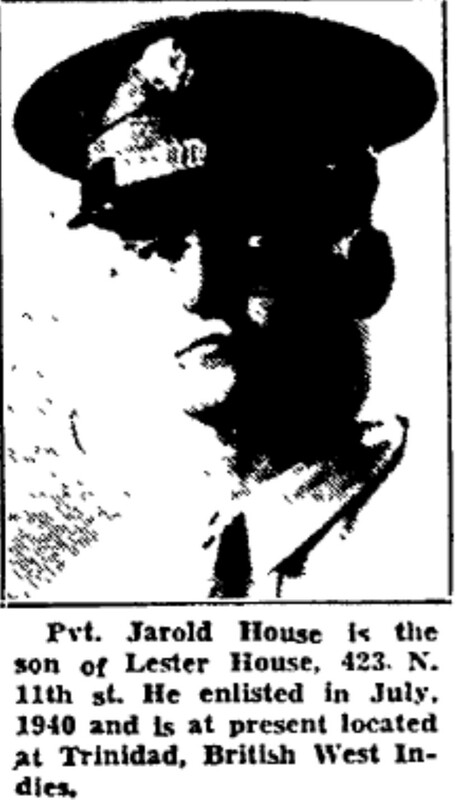 He enlisted on July 19, 1940 at Fort Hayes in Columbus, Ohio. During his duties, he was sent to Trinidad in the British West Indies, stationed at Camp Robinson in Arkansas, and also Italy. In August 1943 he married Elizabeth Johnson. When she went to visit him a few months later in Arkansas, she found him “leading an improper life and associating with other women”. Soon she had filed for divorce. It took over a year for the divorce to be finalized. There hadn’t been any children born to this union. In April 1942 Lester was required to register for WWII. Called the “old man’s draft”, he completed the registration card at age 55. He listed Pearl House as the person who would always know his address. He lived in the same house he’d grown up in: 423 N. Eleventh Street, Coshocton, Ohio (the home that was willed to him by his parents). He was working at the Warner Brothers Theater on N. 6th Street in Coshocton and listed that he had distinguishing characteristics of both his thumb joints. He was 5’10” and weighed 160 lbs. with blue eyes, brown hair and a ruddy complexion. In December 1944, Pearl became ill, possibly having a mental breakdown. Lester took her to the doctor. Requesting that he take his wife to a hospital in Columbus, Pearl was hysterical. She threatened to end her life as well as her husband’s. Thinking that he would try to prevent any suicide attempt, Lester took the firing pin from the shotgun he owned and went to work as a janitor at the Bancroft school building on the morning of April 5, 1945. Not too long after her husband left for work, Pearl figured out how to work the shotgun and killed herself. Lester had called the doctor and then went back home where he found his wife’s body. The coroner listed her official cause of death as multiple lacerations of brain due to discharge of shotgun in head, self-inflicted. With his son in the service in Italy, Lester and Evelyn had to come to terms that Pearl had ended her own life in the community they had lived in all their lives. She was buried in Prairie Chapel Cemetery in Coshocton County, Ohio two days later. Once again, a devastating tragedy had left Lester looking for a way to pick up the pieces of his life. He had hardly gotten his breath when his older brother, John, died on October 22, 1945 due to coronary thrombosis. He had already lost another brother, Florus, in 1941 and a half-sister, Lucina, in 1937. His oldest sister had died in childbirth in 1907. There were only a half-brother, half-sister and one sister left. 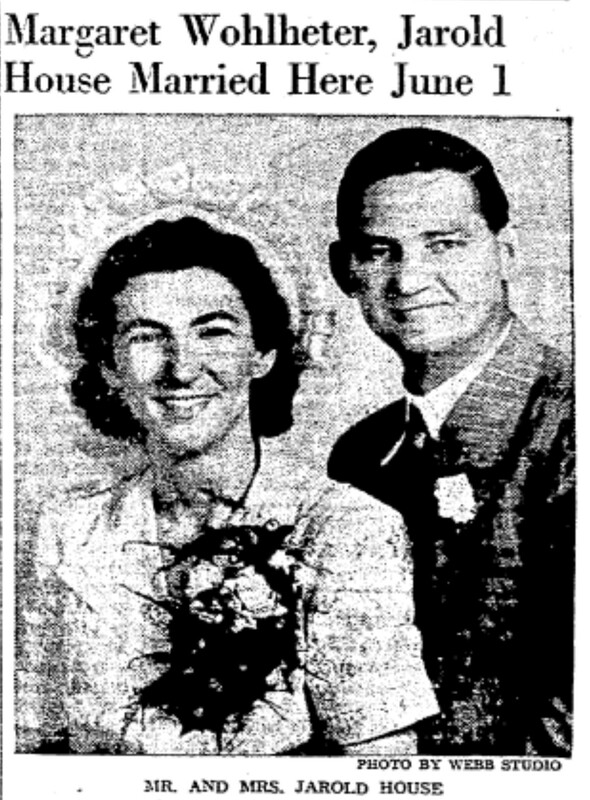 A month after John died; Lester celebrated the marriage of his daughter, Evelyn, to Ellis Murray close to Thanksgiving 1945. The joy soon turned to more grief as Lester’s half-brother, Ed House, died three days after Christmas of a cerebral hemorrhage. It had been so quick and sudden that it was initially reported that he’d died of a heart attack. Lester’s family was dwindling and more people he loved were dying. Then came the news in 1946 that his son had been wounded serving with the United States 5th Army in Italy. He’d received wounds to his right arm, chest and thigh and received a Purple Heart. In July of that year, Lester’s only remaining sister passed away of breast cancer. A bright spot came in June 1947 when there was a wedding to celebrate. Jarold and Margaret Ruth Wohlheter married at the Zion Methodist Church in Adamsville, Muskingum County, Ohio. Within several years, the couple’s family had grown as their children were born. 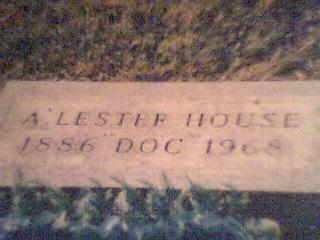 Lester then lost his last surviving sibling, his half-sister, Belle Dora (House) Ruby, on November 12, 1951. He was the last one left of his father’s children and time was slowly catching up to him. At some point, something must have changed within Jarold. Something so unsettling that Lester had even more to be concerned about. In 1958 his son was arrested on morals charges and sent to the State Mental hospital for a sanity hearing. Finding him sane, he was released back to Coshocton County to be arraigned. In March he was sentenced to 1-20 years in prison at the Ohio Penitentiary. A month later, Margaret filed for divorce. The judge hearing the case found no evidence of cause and dismissed the divorce. It is unknown the length of Jarold’s sentence or if a divorce ever occurred. Lester died in January 1968. He was survived by his son, Jarold, his daughter, Evelyn, and four grandchildren. Services were held at Gibson and Bontrager Funeral Home and was buried next to his wife, Pearl, at Prairie Chapel Cemetery in Coshocton County, Ohio. 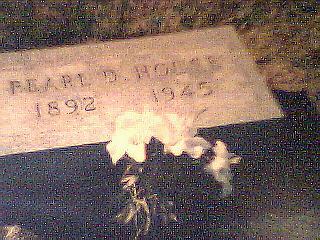 Epilogue: Jarold died in August 1980 and Evelyn died in 1985. It is my wish that my Great-uncle Lester finally found some measure of happiness in his later years. He had endured so much tragedy and loss in his lifetime that he deserved some bright spots.